Bonn, 11 November 2015 - It is hard to imagine any two environments more different than the Arctic tundra and the wetlands of Africa. Yet these contrasting zones are firmly connected by the invisible flyway that represents yearly migration routes of many waterbird species. 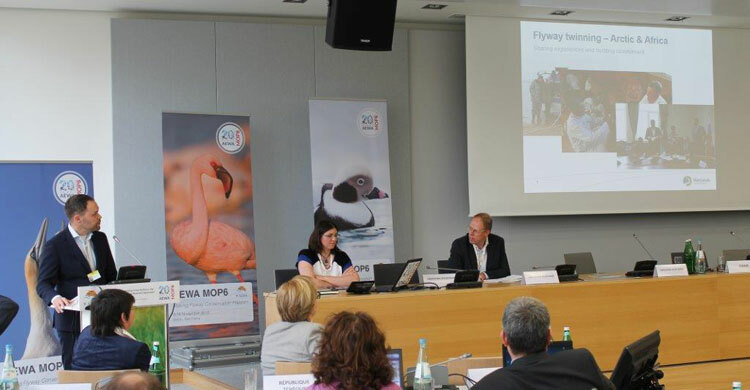 The project presented today in the margins of AEWA MOP6 by Wetlands International experts Ward Hagermeijer and Merijn van Leeuwen attempts to make conservation of migratory waterbirds successful by twinning the endpoints of the flyway. This approach embodies the governing principle of AEWA – the focus is on the full flyway and on the chain of sites where the conservation action is most needed. While migratory bird conservation has been very successful in Europe, losing breeding grounds in the Arctic or wintering sites in Africa can jeopardize conservation efforts. Ms. Tatiana Minayeva covered work done within the framework of the project in the Nenets region in Northern Russia, followed by Mr. Abdoulaye Ndiaye who presented the work in the Senegal Delta of Africa. The speakers emphasized another crucial aspect of ensuring the success of conservation efforts – getting local stakeholders on board by incorporating local interests. These include sustainable use as means of safeguarding natural resources, climate change adaptation measures and disaster risk reduction. To this end, a new project was presented by Dr. Christiane Paulus, Deputy Director General of the Federal Ministry of Environment, Nature Conservation, Building and Nuclear Safety of Germany. The project developed and funded by the government of Germany in collaboration with Wetlands International and partners in Ethiopia and Mali aims to establish a climate-resilient site network along the African-Eurasian flyway. The project will guide the development of protected areas that are important for the transboundary conservation of migratory waterbirds along the flyway and the implementation of AEWA. It will focus on assessing the vulnerability of critical sites for migratory waterbirds to climate change and promoting community-based wetland restoration projects to increase the resilience of both waterbird populations and local communities to climate change.